Hair loss resulting in thinning is known as alopecia. When it is related to hormones (androgens) and genetics, it is known as androgenetic alopecia. When androgenetic alopecia denudes an area of the scalp it is called baldness. 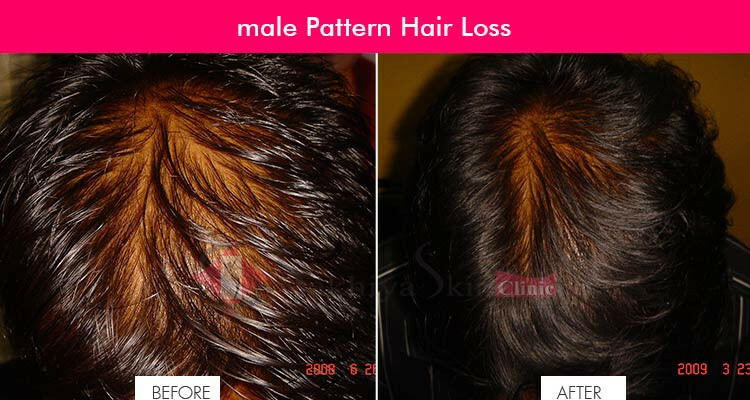 Male pattern hair loss is characterized by a receding hairline and/or hair loss on the top and front of the head. A similar type of hair loss in women, female pattern hair loss, results in thinning hair on the mid-frontal area of the scalp and is generally less severe than occurs in males. Hair loss resulting in thinning is known as alopecia. When it is related to hormones (androgens) and genetics, it is known as androgenetic alopecia. When androgenetic alopecia denudes an area of the scalp it is called baldness. Male pattern hair loss is characterised by a receding hairline and/or hair loss on the top and front of the head. A similar type of hair loss in women, female pattern hair loss, results in thinning hair on the mid-frontal area of the scalp and is generally less severe than occurs in males. 2. What causes pattern balding? Several genes are involved, accounting for differing age of onset, progression, pattern and severity of hair loss in family members. The susceptibility genes are inherited from both mother and father. At this time, genetic testing for prediction of balding is unreliable. All hair follicles are replaced at different rates by the normal process of hair cycling. Hair growth alternates between phases of activity and rest. The growth period, called the anagen phase, lasts for two to six years. During this time, the follicle is long and deep, and produces thick, well-pigmented hair. About 90% of all scalp hairs are in the anagen phase at a given time. Anagen is followed by a brief transition phase known as the catagen phase, which lasts 1–2 weeks. During this time, the base of the follicle shrivels. The resting period, or telogen phase, follows catagen and lasts for 3 months. In this phase, the shrunken follicle retains the hair fibre. Following the telogen phase, the next anagen phase begins, and the old hair is dislodged and falls out to make room for a new hair to begin growing in its place. 4. What is Hair Miniaturisation? 5. Where is DHT found in the body? DHT is found in several tissues in the body including the prostate gland and skin. 6. What is the role of 5-alpha reductase in the body? 5-alpha reductase is an enzyme that regulates production of DHT. An enzyme is a protein that acts as a catalyst to speed up a chemical reaction. 5-alpha reductase can be inhibited by specially synthesised drugs (see below). 7. What role does heredity/genetics play in the male pattern hair loss? Male pattern hair loss occurs in men who are genetically predisposed to be more sensitive to the effects of DHT. Researchers now believe that the condition can be inherited from either side of the family. 8. How common is male pattern hair loss? Male pattern hair loss affects nearly all men at some point in their lives. It affects different populations at different rates, probably because of genetics. Up to half of male Caucasians will experience some degree of hair loss by age 50, and possibly as many as 80% by the age of 70 years, while other population groups such as Japanese and Chinese men are far less affected.The severity of hair loss can be classified in several ways. 9. Isn't hair loss just a cosmetic issue? Male pattern hair loss can have a negative psychological impact. Studies have shown that hair loss can be associated with low self esteem, depression, introversion, and feelings of unattractiveness. This is reinforced by attitudes in Western society, which place great value on youthful appearance and attractiveness. Some studies have shown that based on appearance alone, men with hair loss are seen as less attractive, less assertive, less likeable, and less successful than men without hair loss. 10. What treatments are available for male pattern hair loss?